1. How to Think in Legal Terms. It’s Hard to Fight What You Don’t Understand. 2. How to Make Your Attorney (especially a public defender) Actually Fight Your Case. 3. How to Read the “Table of Contents” (in federal court, called a docket sheet) in a Court Case. 4. How to Read and Research the Law. Do You Know What Faretta v. California 95 S.Ct 2525 (1975) or 28 U.S.C. § 1654 Mean? 5. What You Need to Know Before Pleading Guilty. 6. How to Draft Pre-Trial Motions. 7. What to Expect in Real Life Criminal Prosecutions. It’s Worse Than You Think. 8. Rules of Criminal Procedure. It’s A Real Life Game of Chess. You Had Better Know How to Move the Pieces. 9. How to Fight Back Against Corrupt Judges and Dishonest Prosecutors. 10. How to File a Notice of Appeal. 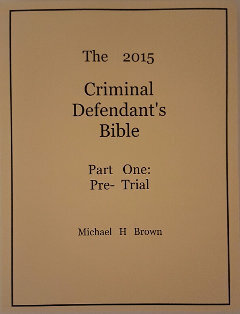 The 1999 version of “The Criminal Defendant’s Bible” is no longer being published. The author, Michael H. Brown revised the book in 2015. The book will now be two separate books. This book, Part One (Volume One) teaches Pre-Trial legal strategies. While this book is 500 pages it contains copies of actual court documents. In order to avoid confusion, the page numbers of the book have brackets around them. The court documents have their original numbering on them and do not have a book page number on them. Part Two (Volume Two) will be published in 2016. It will Teach You How To Draft An Appeal, Write A Reply Brief, File A Petition For Habeas Corpus (28 U.S.C. § 2241 to 2255) And A Petition For Writ Of Error Coram Nobis (the petition you file to overturn a conviction after you have served all your time). Please note: There are 2 printing errors with this book. The title of the book on the binding is upside down. The very top line of text throughout the book has a very faint printer line. The line is hardly noticeable and does not in any way effect the readability of the text.